This surname is of Anglo-Saxon origin, and is either a locational name from a minor place thus called in the parish of Ribchester, Lancashire, or a topographical name from residence by a wooded hill. The second element of the name derives from the Olde English pre 7th Century "hyrst" (Middle English "hurst"), knoll, hillock, wooded hill, and the first element may be either the Olde English "haeg", enclosure, "heah", high, or "heg", hay. Topographical surnames were among the earliest created, since both natural and man-made features in the landscape provided easily recognizable distinguishing names in the small communities of the Middle Ages. Early examples of the surname include Thomas de Heyhurst (Sussex, 1327). In 1571, one Lawrence Hayhurst, of Ribhester, was entered in the Lancashire Wills Records held at Richmond. 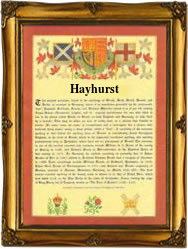 A Coat of Arms granted to the Hayhurst family of Parkhead, Lancashire, is a silver shield, having an azure chevron charged with a golden sun between three hay-rakes proper. The first recorded spelling of the family name is shown to be that of Thomas de Hayhurst, which was dated 1246, witness in the "Assize Court Rolls of Lancashire", during the reign of King Henry 111, known as "The Frenchman", 1216 - 1272. Surnames became necessary when governments introduced personal taxation. In England this was known as Poll Tax. Throughout the centuries, surnames in every country have continued to "develop" often leading to astonishing variants of the original spelling.